VERY GOOD NEWS for the end of the year!! 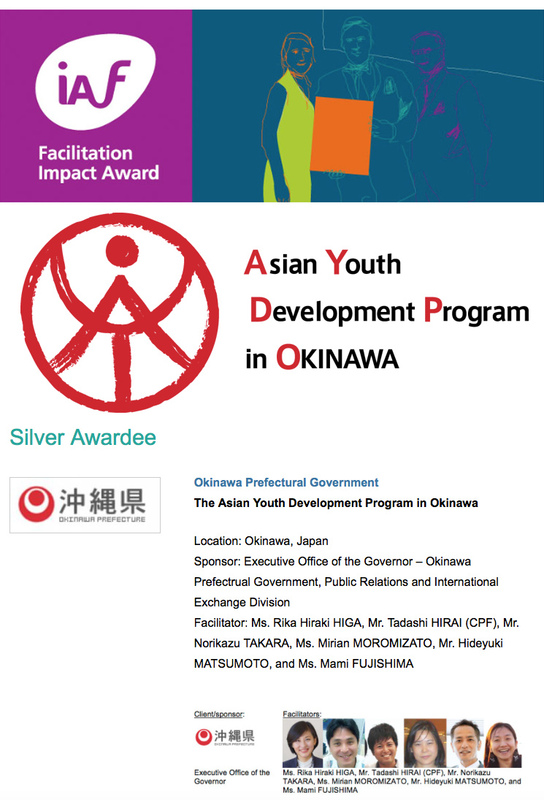 AYDPO received SILVER AWARD in Facilitation Impact Award of International Association of Facilitators! We are really proud of the program and everybody involved including participants, tutors, coordinators, facilitators, and all the staffs!! Posted in 未分類	| Comments Off on AYDPO received SILVER AWARD!! AYDPO will be on AIR!! 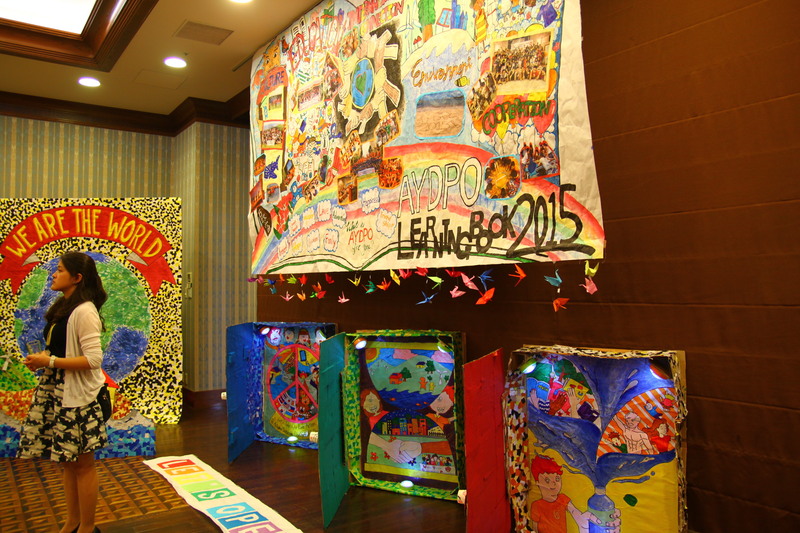 Fellows in Okinawa, Tomorrow, The TV Program of AYDPO2015 will be on a air at 15:54 on OTV!! Posted in 未分類	| Comments Off on AYDPO will be on AIR!! Mr.Oda is now on Japanese Government Commercial for all over the world!! Here is the AYDPO2015 FinalPresentation!! 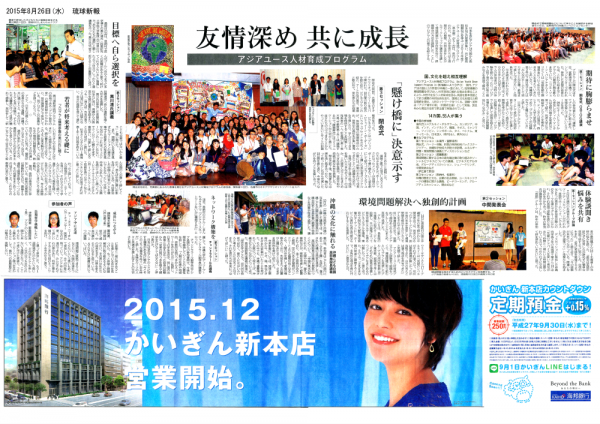 AYDPO is on OkinawaTimes(Local Newspaper)!! 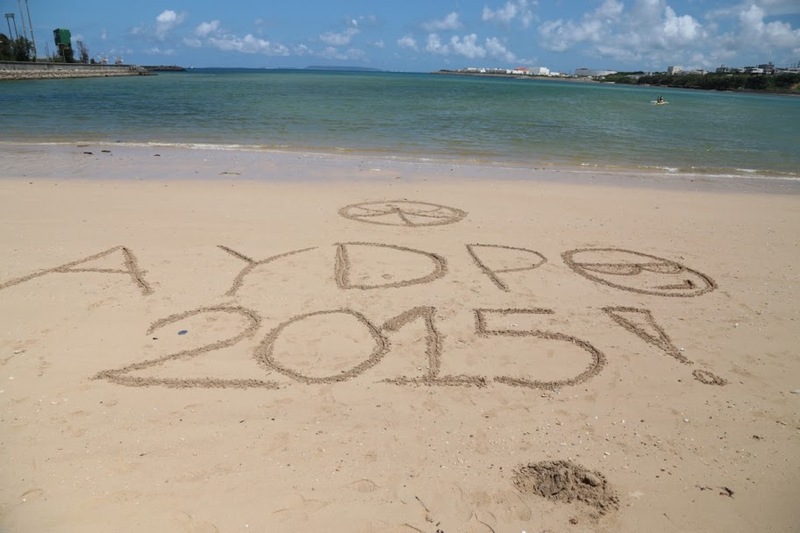 AYDPO is on Okinawa Times(Aug 29th 2015)!! Posted in 未分類, 未分類	| Comments Off on AYDPO is on OkinawaTimes(Local Newspaper)!! 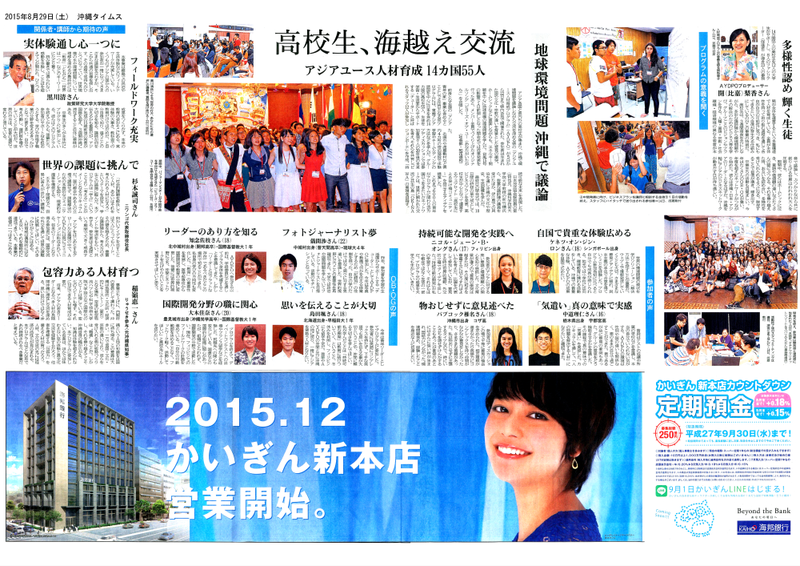 AYDPO is on RyukyuShimpo(Local Newspaper)!! 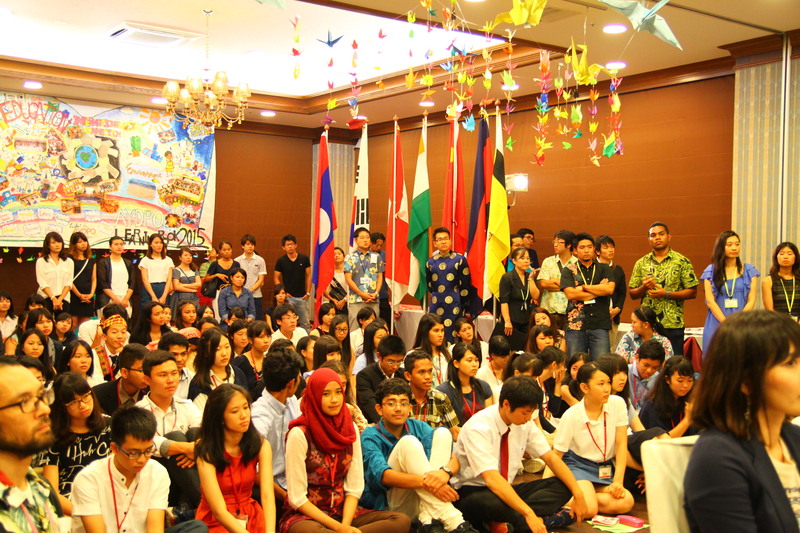 AYDPO is on Ryukyu Simpo(Aug 26th 2015)!! Posted in 未分類	| Comments Off on AYDPO is on RyukyuShimpo(Local Newspaper)!! And i hate saying goodbye. It was hurt when you have to leave all the people that you love. AYDPO changes my Life, my perspective and my Vison. During this program i learn many things. I learn how to be conffident, how to speak up my mind, how to work as a team and how to show to others about our goals. It was one of the best 3 weeks in my life. Last day was full of tears and dissapointment because we have to go back to our countries, but we made a promise, we promise to each others to not saying GOOD BYE but we will See each others again in the future because once we become a Family we will always be a Family. Thank You AYDPO for this amazing experiences. Posted in 未分類	| Comments Off on Final Presentation has successfully Done!! Tomorrow will be the day to say goodbye:( it’s amazing that we fight together for the final presentation with such passion that it becomes a huge success. At noon we have lunch with our aluminis, so happy to see them again!!! 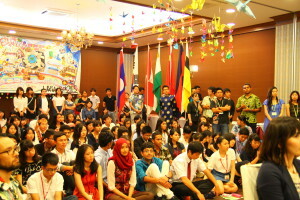 This is the party night for AYDPO family!!! One more thing, I love the sweet in the hotel sooooo much!!! !